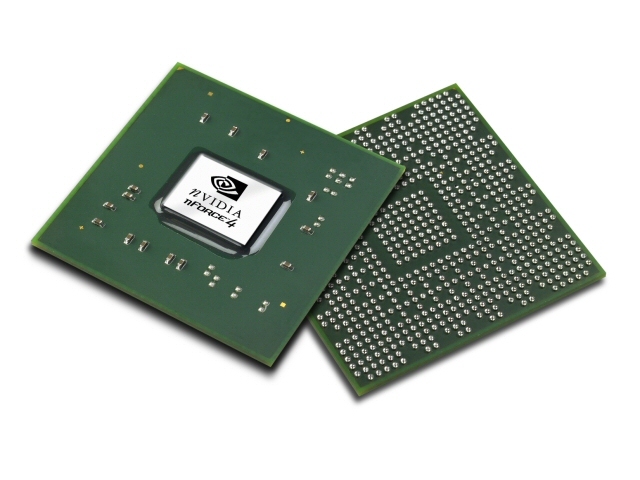 "The C51, graphics giant nVidia's first chipset to feature integrated graphics since 2002, will be launched on September 20, according to a source in Taiwan's PC manufacturing industry. 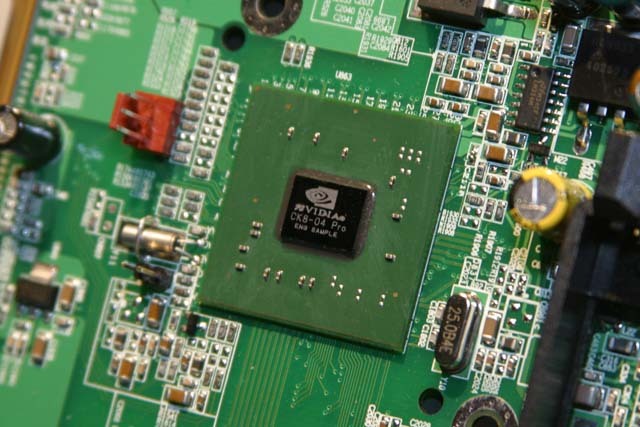 The two chip C51 (the real name has yet to be announced by nVidia), will come in several different versions, with support for AMD CPUs initially." 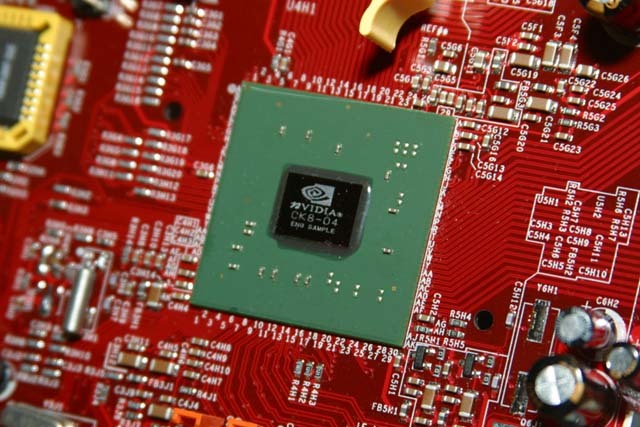 "Nvidia is preparing two version of the chipset - one called C51G and one called C51D. As you can imagine, G stands for Graphic while D stands for Discrete. The G51G will have Shader model 3.0 powered Geforce 6200TC like graphic card. It will use TC – Turbo Cache marchitecture and will be able to address some nice quantities of RAM memory"
"C51G Northbridge will feature the soon to be introduced NV44 graphic card. 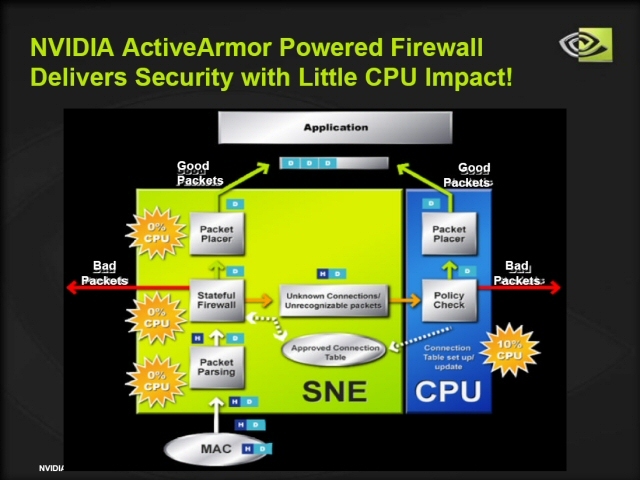 NV44 desktop version will end up as 6600TC (Turbo cache) and I guess that Nvidia will use turbo cache marchitecture to use system memory more efficiently than before"
"The Secure Networking Engine (SNE) inside nForce4 serves as dedicated hardware for the Nvidia Firewall app that ships with it. The SNE performs stateful inspection on all data coming in from nForce4's integrated Gigabit Ethernet adapter and blocks any bad packets. "And the advantage is, we can do this at full Gigabit Ethernet speed without slowing down the CPU," Henry said." "Sound Storm was excluded from Nforce 3 150 and Nforce 3 250 Gb as well and NVDA didn’t give us any good explanation why, but as we said it's too expensive to license it and it certainly takes quite a large portion of chip. " "It seems that Nvidia wants to focus on discrete, not to say discreet chipsets and the retail power only it is now doing a great job especially in the Athlon XP/Duron/Sempron league. Well Nvidia did mess up with Nforce 3 150 but it went back on track with Nforce 3 250 and we are sure that Nforce 4 will continue that nice tradition of being a good silicon boy. " "CrushedK8-04 will come in three flavors, CK8-04 SLI, CK8-04 Ultra and CK8-04. The Ultra and SLI chipsets are simply improvements upon one another, with the SLI chipset being the highest end solution. Vanilla flavored CK8-04 is very much the same as nForce3 250Gb, with the addition of 7.1 high definition audio and PCI Express. We also get four SATA 150 ports. RAID, 10 USB ports. 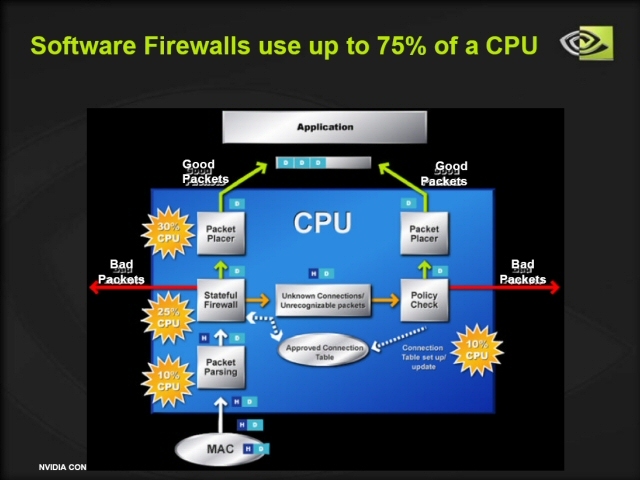 Gigabit Ethernet and a hardware firewall. "" "As for sound freaks, this chipset will feature SP-10, Soundstorm 2 audio that will be Dolby Digital 5.1 compliant and it will be able to do EX effects at 20 GFlops processing power. Soundstorm 2 supports 5.1, 6.1 and 7.1 speaker configurations"
"NVIDIA’s core-logic code-named CK8-04/Pro designed for AMD’s Socket 939 processors will sport 1000MHz HyperTransport bus, 4 Serial ATA-150 ports with RAID, 2 Parallel ATA-33/66/100/133 channels with RAID, Gigabit Ethernet, 10 USB 2.0 ports, 4 PCI slots, High-Definition 24-bit 96kHz 7.1 audio as well as something NVIDIA calls PCI Express x20." "On the AN8 Ultra, the heatpipe barely got warm to the touch, but on this board (ABIT NI8 SLI) it got scorching hot. 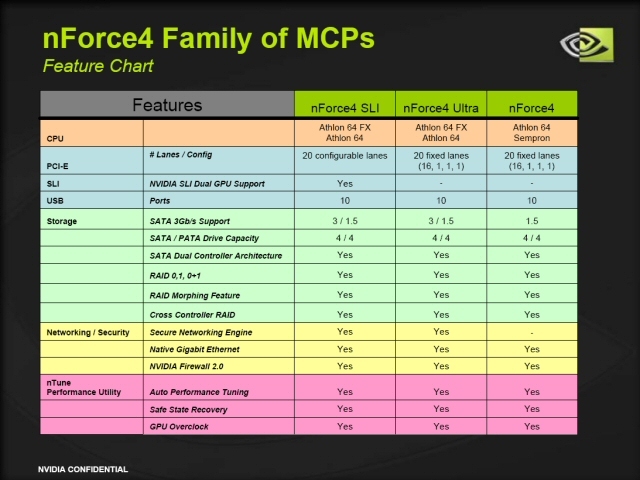 It seems that that the nForce4 Intel Edition chipset runs a lot hotter than its AMD counter part."